1. Palestine represents the formal division of God's land that He expressly prohibits in Joel 3:2 and Zechariah 1:18-21. In fact, it is likely this very division of land that catapults the world into Daniel's 70th Week (Daniel 9:27). 2. 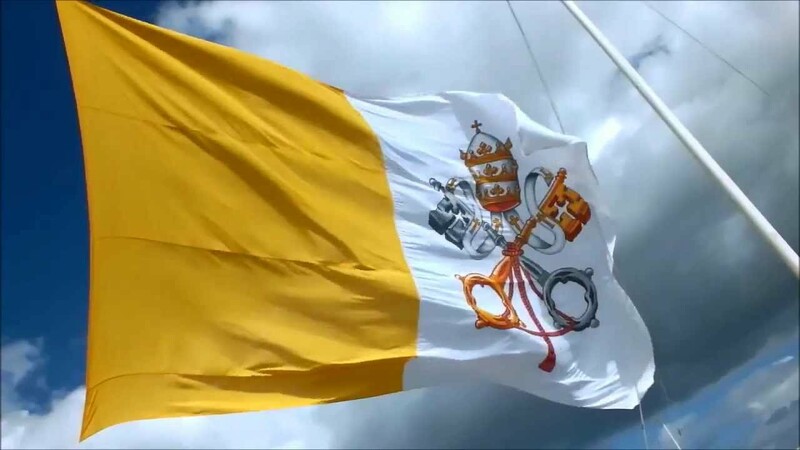 The Vatican represents the largest apostate Christian movement in all of human history: works-righteousness and rejection of the Gospel; mass persecution of Believers; idolatry towards Mary, angels, and saints (though this is fervently denied it is still clearly practiced: graven images (Exodus 20:4), bowing down (Exodus 20:5; Revelation 22:8-9), sharing God's glory with them); the doctrines of the Immaculate Conception (see Romans 3:23, Ecclesiastes 7:20, and Galatians 3:22) and Co-mediatrix; and prohibition of marriage (1 Timothy 4:3). And now we can see how Pope Francis is taking this all a step further: eroding God's moral law, moving away from the exclusive claims of Christianity (John 14:6, Acts 4:12), and moving towards union with false religions. 3. Lastly, in the UN's 70 years of existence, only member states' flags have been flown. Tomorrow's vote is unprecedented because the Vatican and Palestine are merely observer states. It'll be interesting to see who votes for/against this!